Dolly's Blue Smoke holds steady at No. 2 in the album's 86th week on the British country compilations albums chart, Friday's charts revealed. On the same tally, Dolly's The Tour Collection falls off the top 20, down from No. 15, as Emmylou Harris' Original Album Series, Volume 1 (with two Dolly covers, one track with Dolly harmony and one track with Trio harmony by Dolly and Linda Ronstadt) holds steady at No. 19 and her Original Album Series, Vol. 2 (featuring one track with Dolly harmony and two tracks with Trio harmony) re-enters the top 20 at No. 15, while Ronstadt's own Original Album Series (featuring one Dolly cover and one track with Dolly harmony) dips four to No. 20. In the U.S., Don Henley's Cass County, which features Dolly on "When I Stop Dreaming," loses four to No. 18 on the country albums chart in its 25th chart week and re-enters the current albums tally at No. 97 for a 14th chart week, the Feb. 6 Billboard charts released Tuesday showed. MIC's style section this week praised Dolly as "a feminist fashion icon," noting her "happy, no-fucks-given disregard for trends and public approval – combined with an undying commitment to clothing of costume proportions" inspired today's fashion icons including Beyonce, Lady Gage, Miley Cyrus, Kathy Perry and Nicki Minaj. Read the profile here. A few days ago, Tonight Show host Jimmy Fallon did his "thank you notes" segment and thanked Dolly for turning 70 this month, joking she doesn't look a day over 38-26-36. Watch the clip here. Sandy Gallin recently appeared on Andy Cohen's satellite radio program and told a story about how Dolly almost didn't record her first pop crossover hit, "Here You Come Again," and how he convinced her to do it. Read more here. Dolly's Branson, Mo., Dixie Stampede dinner theatre is undergoing a massive renovation, the chain announced this week. Although details are sketchy at this time about show changes, the renovations include a new LED wall backdrop like the one installed recently at the flagship theatre in Pigeon Forge, Tenn. In a press release, Dolly said: "First, I want to thank the Branson community for the support you've given my Dixie Stampede for the past 21 seasons. You all have made the show such a success, and now I'm excited to announce we're making some changes that will take the show to whole new level! My team is hard at work creating a new set, powerful new music, lots of amazing special effects and a few other surprises. This amazing technology has allowed us to really take our guests on a 'new adventure.' I just know families are truly going to love it!" Australian publication Starts At Sixty took a look at Dolly's expansion of her Imagination Library literacy charity Down Under with a piece here Friday. The Movieguide Faith & Values Awards on Friday revealed Dolly will not only be in attendance but also serve as a presenter at their Feb. 5 awards program. Dolly Parton's Coat Of Many Colors is nominated for the Epiphany Prize for Most Inspiring TV Program and its cast members Alyvia Alyn Lind, Gerald McRaney and Jennifer Nettles are nominated for Most Inspiring Performance for Television. The presentation will be broadcast on the REELZ Channel Feb. 22. Other presenters announced in the press release included Coat co-stars Ricky Schroder and Alyvia Alyn Lind as well as Jane Seymour, Ernie Hudson, John Schneider, Kevin Sorbo and Pat Boone, among others. Dolly's Blue Smoke holds steady at No. 2 in the album's 85th week on the British country compilations albums chart, Friday's charts revealed. On the same tally, Dolly's The Tour Collection gains five to No. 15 while Emmylou Harris' Original Album Series, Volume 1 (with two Dolly covers, one track with Dolly harmony and one track with Trio harmony by Dolly and Linda Ronstadt) loses five to No. 19 and her Original Album Series, Vol. 2 (featuring one track with Dolly harmony and two tracks with Trio harmony) falls off the top 20, down from No. 17, while Ronstadt's own Original Album Series (featuring one Dolly cover and one track with Dolly harmony) slips one to No. 16. The University of Tennessee's Daily Beacon offered a recap of the recent birthday celebration for Dolly's 70th in Knoxville here. Dolly on Thursday announced the first details on changes to her newest attraction in Pigeon Forge, Tenn., the Lumberjack Feud dinner theatre, which she purchased a few months ago. When the venue reopens in May it will be known as Dolly Parton's Lumberjack Adventure Dinner & Show with a brand new show, storyline, menu and cast. "I'm truly excited to be working on a new show for families to enjoy while they are in town," Dolly said in a press release. "We did a lot of work to come up with the name of the new show and I think we found the perfect fit. My creative team has been working to produce an exciting show which will showcase the amazing competitive skills of our cast. We have a few surprises that will certainly make this an 'adventure' for every member of the family." Renovations are underway at the building and the adjacent Regency Inn will be demolished for additional parking and visibility. Progress of the renovations will be shared on their website at www.lumberjackadventure.com. Magician Brad Ross this week released a video to Vimeo announcing he will headline Dollywood's summer festival this year with a residency in DP's Celebrity Theatre with his magic show, Unbelievable. Check out the video here. The Huffington Post UK on Wednesday posted a guest column blog entry from Dolly celebrating her Imagination Library, its history, its success and its recent expansion to London. Take a read here. Don Henley's Cass County, which features Dolly on "When I Stop Dreaming," holds steady at No. 14 on the country albums chart in its 25th chart week, the Jan. 30 Billboard charts released Wednesday showed. New York trio Siren this month celebrated Dolly with a cover of her classic "Jolene." Check it out on YouTube here or in the media player below. Happy 70th Birthday, Dolly! 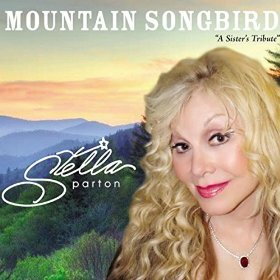 Sister Stella Parton on Monday premiered her full tribute song Mountain Songbird from her tribute album of the same name consisting mostly of covers of Dolly's greatest compositions. Watch the video here. Knoxville TV station WBIR offered a timeline of her major accomplishments here. Parade compiled 10 "of her quotes to live by" here. Knoxville's Local 8 TV noted that Sevierville's Courthouse Donuts is asking customers to sign a large birthday card in the restaurant, while Sevierville Intermediate School's drama club plans to record a video of 85 kids singing her "Happy Birthday" and "I Will Always Love You." Read more here. And in honor of her special day, CMT's Katie Cook posted to Facebook a compilation of her favorite interview moments with Dolly, almost all of which are just a little naughty! Watch them here! Music on Vinyl, a specialty record label that back in August re-issued Dolly's 1974 classic Jolene on collectors' grade 180 gram audiophile vinyl, over the weekend announced the same treatment next month for her 1971 album Coat Of Many Colors, which will also be released on 180 gram vinyl. The official release date is Feb. 1, although Amazon.com is showing an anticipated in-stock date of Feb. 12 here. Little Dolly from NBC's Dolly Parton's Coat Of Many Colors, Alyvia Alyn Lind, lost out to Fargo's Kirsten Dunst on Sunday for the Critics Choice Award for Best Actress in a Movie Made for Television or Limited Series. The other nominees were Kathy Bates for American Horror Story: Hotel, Sarah Hay for Flesh and Bone, Rachel McAdams for True Detective and Shanice Williams for The Wiz Live!. Although Lily Tomlin broke the news several days ago in a couple of interviews, Grace & Frankie executive producer Marta Kauffman on Sunday confirmed there will be no Dolly on the second season of the Netflix series starring 9 To 5 co-stars Tomlin and Jane Fonda. She reiterated the answer given since the show started, which Entertainment Weekly quoted here as: "We're still creating a world and that world is Grace and Frankie. These are characters you want to know and invest in. The minute we bring in Dolly Parton, who I love, it's 9 To 5, no matter what you do." She added, however, she will never say never to the idea of Dolly appearing on the show after the second season. Tomlin had said both she and Fonda have pitched ideas to Kauffman of how to bring Dolly in for a cameo in the show's third season. It has been nearly nine years since Dolly's Imagination Library literacy program spread to Great Britain and a year and a half since the program there passed 1 million books distributed on the island, but the project has just reached London with Friday's announcement that it has been launched in the Southwark community thanks to the local government and a local company named DialAFlight. Dolly unveiled the expansion with a video viewable in the media player above or by visiting YouTube here. Coverage of the announcement is available from Southwark News here and BT here. Just under 80 communities across the U.K. operate the program, although the first to implement it, Rotheringham, recently ended its affiliate as part of municipal budget cuts. Also overseas, Dolly's Blue Smoke regains one place to No. 2 in the album's 84th week on the British country compilations albums chart, Friday's charts showed. On the same tally, Dolly's The Tour Collection loses six to No. 20 while Emmylou Harris' Original Album Series, Volume 1 (with two Dolly covers, one track with Dolly harmony and one track with Trio harmony by Dolly and Linda Ronstadt) rises six to No. 14 and her Original Album Series, Vol. 2 (featuring one track with Dolly harmony and two tracks with Trio harmony) slips two to No. 17, while Ronstadt's own Original Album Series (featuring one Dolly cover and one track with Dolly harmony) re-enters the top 20 at No. 15. The music video for Dolly's duet with Don Henley on "When I Stop Dreaming" has entered the Taste Of Country top 10 video countdown this week, coming in at No. 10. Check out the full list, which also sees Home Free's cover of Dolly's "9 To 5" at No. 1, here. The president of Rhino Entertainment this week told Billboard the label is still planning to release the planned Trio boxed set. Although the release date was not mentioned, the article on premium box sets here confirmed the label "is moving ahead with a box set devoted to the Trio recordings of Emmylou Harris, Dolly Parton and Linda Ronstadt." The set, which was originally announced last fall to contain both of the Trio albums plus a third album of unreleased songs and alternate takes, was originally slated for an October 2015 release but was delayed, and Ronstadt's manager said at the time that it was now slated for a second quarter 2016 release. Don Henley's Cass County, which features Dolly on "When I Stop Dreaming," gains a dozen places to No. 14 on the country albums chart in its 24th chart week, the Jan. 23 Billboard charts released Tuesday showed. Country Faith Christmas, featuring Dolly's 1990 recording of "Joy To The World," falls off the Christian albums and Christian and gospel albums charts, down from No. 39 and No. 46 respectively. Rhonda Vincent's holiday collection, Christmas Time, with Dolly and several other guests on "The Twelve Days Of Christmas," falls off the bluegrass albums chart, down from No. 12 in its ninth week. Two music legends with strong Dolly connections will be honored this year with special awards from the Recording Academy at the Grammys, it was announced Wednesday. Trio member Linda Ronstadt, who shares two Grammy Awards with Dolly and Emmylou Harris for their collaborations, will receive a Lifetime Achievement Grammy, which "honors performers who have made contributions of outstanding artistic significance to the field of recording." Also, Monument Records and Combine Music founder Fred Foster, who signed Dolly to her first long-term recording and songwriting contracts and produced her first full-length album, 1967's Hello, I'm Dolly, which brought her to the attention of Porter Wagoner and started her career, will receive the Trustees Award, which "recognizes similar contributions as the Lifetime Achievement Award in areas other than performance." Foster also produced most of Kris Kristofferson's hits, Roy Orbison's biggest songs and recordings by Willie Nelson, Ray Stevens and others. Dolly, who has seven regular Grammys, received her Lifetime Achievement Grammy in 2011. Dolly plans to be in attendance at the Hollywood Movieguide Awards on Feb. 5, according to an announcement from the event organizers on Wednesday. Dolly is included in a list of "special guest celebrities due for attendance" which also features Jayne Seymour, John Schneider, David Foster, Jackie Evancho, Pat Boone, Kevin Sorbo and more. As was reported here Tuesday night, Dolly Parton's Coat Of Many Colors is nominated for the Epiphany Prize for Most Inspiring TV Program and its cast members Alyvia Alyn Lind, Gerald McRaney and Jennifer Nettles are nominated for Most Inspiring Performance for Television. The presentation will be broadcast on the REELZ Channel Feb. 22. See the story here. Ever wonder where Dixie Stampede gets its boot-shaped drink cups? Plastics News this week took a look at Greenleaf Industries, which took over manufacturing them for Dolly's dinner theatres once their original supplier went out of business. They make 400,000 of the collectible cups for Dolly's restaurants each year. Read about it here. 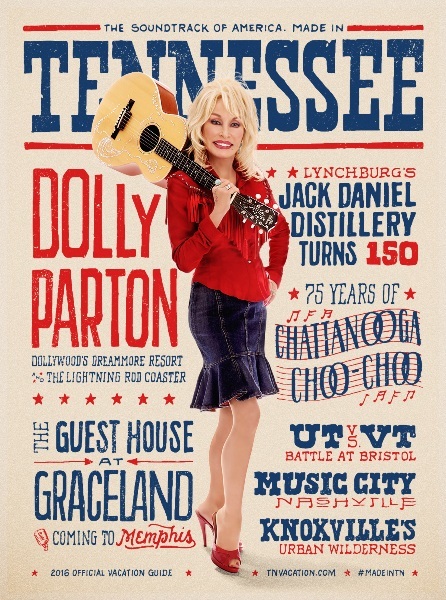 Tennessee's Department of Tourist Development on Tuesday released its 2016 Official Tennessee Vacation Guide featuring Dolly on its cover, seen at left (click on it for a larger view). The Soundtrack of America-themed cover sees the article on Dolly inside describe her as "the living, breathing, stiletto-wearing, songwriting, sweet-singing, play-writing, movie-starring, philanthropizing, bookscribing, arts-championing embodiment of the spirit and creativity of the Volunteer State." In a press release, Tourism Commissioner Kevin Triplett said: "Dolly Parton is a Grammy Award winner (10 and counting), a Kennedy Center Honoree, a Country Music Hall of Famer, and currently experiencing tremendous attention with the tremendous success of her TV movie, Coat of Many Colors. But she is first and foremost a Tennessean and provides unparalleled support of her home state. She welcomes guests to her new resort, is expanding Dollywood and other attractions and is making new music. We are fortunate to work with Dolly in marketing Tennessee and honored to have her grace the cover of the 2016 Official Tennessee Vacation Guide." The publication also highlight's Dollywood's DreamMore Resort and Lightning Rod Roller Coaster. An initial printing of 550,000 guides will be distributed free at the state's 14 Welcome Centers and to guests requesting the publication via tnvacation.com and 1.800.GO2.TENN. It is also available as an e-guide at tnvacation.com/guide. Nominations were announced Monday for the 24th Annual Faith & Values Awards Gala presented by Movieguide: The Family Guide to Movies and Entertainment and the Christian Film and Television Commission, and NBC's project Dolly Parton's Coat Of Many Colors came up in two categories. Winners will be announced Feb. 5 in Los Angeles with the awards program aired on the REELZ Channel Feb. 22 and 24. Dolly's project is nominated for the $100,000 Epiphany Prize for the Most Inspiring TV Program of 2015, competing against A.D.: The Bible Continues, Ancient Roads from Christ to Constatine, Blue Bloods: Hold Outs, Saints & Strangers and Chicago Fire: Forgiving, Relentless, Unconditional. In addition, cast members Alyvia Alyn Lind, Gerald McRaney and Jennifer Nettles share a nomination for Most Inspiring Performance for Television, competing against Emmet J. Scanlan, Joe Dixon and Juan Pablo Di Pace for A.D.: The Bible Continues, Gordon Clapp for Chicago Fire: Forgiving, Relentless, Unconditional and Vincent Kartheiser for Saints & Strangers. Universal Pictures has released the cover art for the March 8 Blu-Ray release of Dolly's 1982 movie The Best Little Whorehouse In Texas. Check it out below (and click on it for a larger view). Dolly has lent her classic working anthem "9 To 5" to the Winn-Dixie and Bi-Lo grocery chains to portray their new lower price scheme as prices go "Down Down." Check out the Winn-Dixie ad here or in the media player above and the Bi-Lo version here. Coverage of the campaign last week when the ads debuted included The Tampa Bay Times here and Time magazine here. Kenny Rogers and Dolly's Once Upon A Christmas last week fell off all of the U.S. charts it had re-entered for the holiday season, the Jan. 16 Billboard charts showed. It was down from No. 192 Hot 200 albums in its 31st week there, No. 41 Canadian albums, No. 9 county catalog albums in its 106th week there, No. 48 catalog albums in its 26th week there and No. 35 top holiday albums in its 55th week there. Country Faith Christmas, featuring Dolly's 1990 recording of "Joy To The World," fell off the country albums list, down from No. 41 in its eighth week, also dropping 21 to No. 39 Christian albums, 25 to No. 46 Christian and gospel albums and off the compilation albums tally, down from No. 25. Rhonda Vincent's holiday collection, Christmas Time, with Dolly and several other guests on "The Twelve Days Of Christmas," loses seven to No. 12 bluegrass albums in its ninth week. Jewel's Picking Up The Pieces, with Dolly on "My Father's Daughter," falls back off the folk albums chart, down from No. 21 in its 13th week. In its 23rd week, Don Henley's Cass County, which features Dolly on "When I Stop Dreaming," inches down one to No. 26 country albums but falls off the top 200 from No. 113, current albums from No. 71 and album sales from No. 85. Across the pond, Dolly's Blue Smoke slips one spot again to No. 3 in the album's 83rd week on the British country compilations albums chart, Friday's charts revealed. On the same tally, Dolly's The Tour Collection holds steady at No. 14 while Emmylou Harris' Original Album Series, Volume 1 (with two Dolly covers, one track with Dolly harmony and one track with Trio harmony by Dolly and Linda Ronstadt) loses five to No. 20 and her Original Album Series, Vol. 2 (featuring one track with Dolly harmony and two tracks with Trio harmony) rises five to No. 15. The sixth annual unofficial Dolly Fan Dinner tickets went on sale over the weekend. You may remember it announced here several months ago when Dolly's 2016 Pigeon Forge Homecoming parade was set for May 6 that the fan dinner had been finalized for the same evening, as in past years. This year's event will take place at the Mainstay Suites Conference Center in Pigeon Forge, where the ballroom will be transformed into the set of Dolly's "DP's" cabaret from her 1980s television variety show with a dinner menu inspired by some of Dolly's personal favorite recipes and several of the best Dolly impersonators from around the U.S. taking the stage to pay tribute to her. Three package levels are offered: $48 VIP dinner seating, $38 for reserved seating, and $28 for standing-room. Those who purchased tickets last year are eligible for a pre-sale that began on Saturday here, and tickets to the event will be offered to the general public starting on Dolly's 70th birthday, Jan. 19. Organizers are also seeking social media street team members. Those interested should private message them via Facebook here. NBC a few days ago delved a little deeper into the ratings information on the original Dec. 10 broadcast of Dolly Parton's Coat Of Many Colors with the release of the L+7 numbers for that week (live broadcast plus seven days' DVR viewing). The movie saw 15.9 million viewers in L+7 totals, with the additional 2.872 million in delayed viewing setting the all-time record for a primetime movie on any broadcast network excluding live musicals. Previously, the movie had broken the L+3 record with 2.548 million delayed viewers in the first three days after broadcast. Its final 18-49 rating was 2.45. The totals allow it to remain the most-watched movie broadcast on network television in more than six years, since Jesse Stone: Thin Ice saw 16 million in March 2009, a period that saw 275 films watched by smaller audiences. Also, excluding sports programs and live musicals, it was NBC's largest audience for the 9 p.m.-11 p.m. time period since the series finale of ER brought in 17.4 million viewers, and the network's largest scripted telecast audience in 10 months since the 40th anniversary special of Saturday Night Live. In related news, the film's editor, Maysie Hoy, garnered a nomination last week for Best Edited Longform (Miniseries or Motion Picture) for Television at the American Cinema Editors' 66th annual ACE Eddie Awards, which will be presented Jan. 29 at the Beverly Hilton Hotel, facing off against the HBO movie Bessie and a 90-minute episode of the Netflix series Orange Is The New Black. The Dollywood family this week is mourning the loss of Eunice Eledge, who retired from the company first after 30 years in the role of Finance Director and Comptroller at Dollywood (and previously Silver Dollar City Pigeon Forge), and then again after serving as the first Executive Director of the Dollywood Foundation. She passed away last Tuesday at age 88. Services were held over the weekend. Read her obituary from Atchley Funeral Home here and a piece about her for subscribers to The Mountain Press here. The Dolly birthday party in Bay St. Louis, Miss., over the weekend garnered a good deal of press, including an article in The Sun Herald here and a column in the same paper here, plus a preview in advance here. In related news, The Yankton Daily Press & Dakotan in South Dakota reports that their community will celebrate Dolly's birthday with its second annual Dolly Disco roller skating day with Dolly music and karaoke at the Vermillion National Guard Armory Saturday as a benefit for Dolly's Imagination Library. Learn more here. Although the writer noted it was a few weeks late, The Houston Press looked back on the 35th anniversary of the premiere of Dolly's film 9 To 5 and how relevant it remains today to the challenges faced by women in the workplace. Read more here. Speaking of which, in a couple of interviews surrounding her dual Golden Globe nominations, Lily Tomlin has once again mentioned the desire to bring Dolly in for a guest spot in the show's third season (season two begins soon and a third season has been ordered) including The Modesto Bee here. Media site PPCorn a few days ago offered two parts of a list of 15 things you didn't know about Dolly. Check out Part 1 here and Part 2 here. Kenny Rogers and Dolly's Once Upon A Christmas has started its annual descent back down the charts, Tuesday's numbers confirmed. The Jan. 9 Billboard charts saw the 1984 album lose 63 places to No. 192 Hot 200 albums in its 31st week there, 10 to No. 41 Canadian albums, five to No. 9 county catalog albums in its 106th week there, 21 to No. 48 catalog albums in its 26th week there, nine to No. 35 top holiday albums in its 55th week there, and off the 100-position overall album sales list, down from one week this year at No. 99, its 20th week on the chart since its release. Its track "Hard Candy Christmas" by Dolly falls off the 50-position holiday digital songs sales chart, down from No. 46. Country Faith Christmas, featuring Dolly's 1990 recording of "Joy To The World," slips 10 to No. 41 country albums in its seventh week, also dropping three to No. 18 Christian albums, five to No. 21 Christian and gospel albums and nine to No. 25 compilation albums. Rhonda Vincent's holiday collection, Christmas Time, with Dolly and several other guests on "The Twelve Days Of Christmas," dips three to No. 5 bluegrass albums in its eighth week, falling back off the heatseekers albums list and Christian albums chart, down from No. 18 and No. 48, respectively. Jewel's Picking Up The Pieces, with Dolly on "My Father's Daughter," re-enters the folk albums chart at No. 21 in its 13th week. In its 22nd week, Don Henley's Cass County, which features Dolly on "When I Stop Dreaming," drops six to No. 113 top 200, 16 to No. 71 current albums, 17 to No. 85 album sales, and four to No. 15 country albums. Overseas, Dolly's Blue Smoke rebounds one spot again to No. 2 in the album's 82nd week on the British country compilations albums chart, Friday's charts showed. On the same tally, Dolly's The Tour Collection slips five to No. 14 while Emmylou Harris' Original Album Series, Volume 1 (with two Dolly covers, one track with Dolly harmony and one track with Trio harmony by Dolly and Linda Ronstadt) gains four to No. 15 and her Original Album Series, Vol. 2 (featuring one track with Dolly harmony and two tracks with Trio harmony) re-enters the top 20 at No. 20. Two more celebrations of Dolly's 70th birthday have been announced. They'll recognize her special day a little over a week early on Saturday, Jan. 9, in Old Town Bay St. Louis, Miss., with the "We Think Dolly Should Come Celebrate Her Birthday With Us" party presented by Smith & Lens art gallery and featuring a Dolly look-a-like contest, clogging and square dancing, live music, barbeque, biscuits, pie, a Dolly-themed art show, hayrides and more. Check out the event's Facebook listing here. And Joe's Pub in New York City has announced its Sixth Annual "I Beg Your Parton" show headlined by Addie Brownlee and featuring performances by Jill Henderlight, Brad Albetta, The Bengsons and Konrad Meissner will take place Jan. 22 with the traditional all-Dolly-covers night at the venue. Check out their Star Wars-themed teaser video here. The new parties follow previously-announced gatherings scheduled for Dolly's Jan. 19 birthday in Knoxville, Jan. 16 in Indianapolis and Jan. 20 in Seattle that have been reported here in recent weeks. A LinkedIn announcement indicates that the famous Harell Gabehat-Patric Parkey collection of Dolly memorabilia is now being offered for bookings this year and next to be shown across North America. Believed to be the largest privately-owned collection of Dolly items, featuring 40 stage-worn outfits plus accessories and other personal Dolly items, it has only been publicly-displayed once before, at the 2013 CMA Fan Fest and was shown on the TLC program My Collection Obsession, which surprised the couple with a visit to their home by Dolly herself to see the collection. Contact Rockology at 615-504-1512 to inquire about bookings.